As part of the 4000 Ideas Brisbane City Design Competition, sponsored by Brisbane City Council, Brisbane’s future architects have been asked to create a design concept for the site of Brisbane Metro’s new Cultural Centre station portal. The annual competition celebrates young architectural talent, generating new design ideas for Brisbane. This year the competition attracted many creative concept pitches, which range in scale and building purpose. 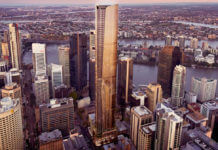 The site in question, currently a vacant slice of land between South Bank Train Station and Grey Street, will house a new state-of-the-art underground Cultural Centre station as part of the Brisbane Metro project. 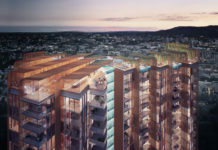 Designs and ideas by QUT and UQ architecture students are competing to win a top prize of $3,500. 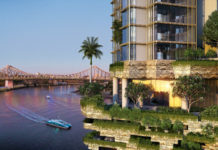 There will also be a People’s Choice award category, which will be decided here on BrisbaneDevelopment.com. Council will procure the design and construction of the new station through a collaborative partnership with industry. The proposed ideas from the competition are welcomed, but will not form part of Brisbane Metro project. HOW TO VOTE – Read through the 12 shortlisted entries below and vote for your favourite design in the poll that follows at the ⇩ bottom of the page ⇩. Your vote will help contribute to the winning People’s choice concept design. Please select your vote below for the people’s choice award. Only one vote per user can be registered. A nice flow through not dominating the landscape with the roof providing valuable sitting and recreational areas. I voted 7A as I believe that the heritage listed South Brisbane Station should be at the forefront of any installation on that Grey Street/Melbourne Street corner. South Brisbane Station should not be overshadowed by a building above ground, and be allowed to clash with any sculptural modern design. A park is needed, a people’s place is needed for a busy corner, and a portal! I believe that 7B is the superior design outcome as it displays a rational approach to the metro station, one that is realistic and legible – capable of supporting the large amount of pedestrian foot traffic as well as subtly allowing for way-finding within the station. The orientation of the upper deck activates the streetscape and I can see this being a hub of activity in the near future!! 2G-portal craft is very good design. My vote is for 6 Playground as I see the structure to be innovative, organic and not intrusive to its surrounding landscape. Great submissions all around. I voted for 3G – Realm of Water because it links areas beyond the site with the use of the bridge to cross the street and it’s elevation at the rear links to the train above which would allow for an extension of the platforms at the adjacent station. In my view, our patchwork public transit must integrate efficiently to best serve us, the customers and a design which draws pedestrians, trains, and metro together is tops for me. Aside from that, I also appreciated the free flowing but covered space on the ground level. I voted for 9 because it is the only one that is practical, aesthetic and realistic. Integrating greenery on the building is very forward thinking as it can have environmental benefits and can be a pleasant place for social interactions in dense urban areas.